↑ Keith Lewis; Scott D. Nodder; Lionel Carter (11 January 2007). "Zealandia: the New Zealand continent". Te Ara: The Encyclopedia of New Zealand. Archived from the original on 26 June 2013. สืบค้นเมื่อ 22 February 2007. ↑ Luyendyk, Bruce P. (April 1995). "Hypothesis for Cretaceous rifting of east Gondwana caused by subducted slab capture". Geology. 23 (4): 373–376. doi:10.1130/0091-7613(1995)023<0373:HFCROE>2.3.CO;2. ↑ "Searching for the lost continent of Zealandia". The Dominion Post. 29 September 2007. สืบค้นเมื่อ 9 October 2007. We cannot categorically say that there has always been land here. 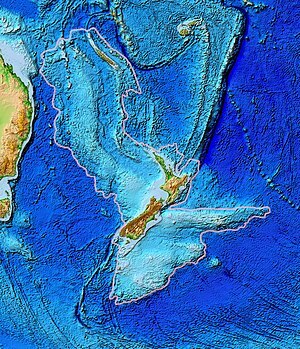 The geological evidence at present is too weak, so we are logically forced to consider the possibility that the whole of Zealandia may have sunk. ↑ Campbell, Hamish; Gerard Hutching (2007). In Search of Ancient New Zealand. North Shore, New Zealand: Penguin Books. pp. 166–167. ISBN 978-0-14-302088-2. ↑ Wood, Ray; Stagpoole, Vaughan; Wright, Ian; Davy, Bryan; Barnes, Phil (2003). New Zealand's Continental Shelf and UNCLOS Article 76 (PDF). Institute of Geological and Nuclear Sciences series 56; NIWA technical report 123. Wellington, New Zealand: Institute of Geological and Nuclear Sciences Limited; National Institute of Water and Atmospheric Research. p. 16. Archived from the original (PDF) on 21 February 2007. สืบค้นเมื่อ 22 February 2007. The continuous rifted basement structure, thickness of the crust, and lack of seafloor spreading anomalies are evidence of prolongation of the New Zealand land mass to Gilbert Seamount. ↑ "Population clock as at Sunday, 08 Oct 2017 at 11:48:07 a.m." 8 October 2017. Archived from the original on 12 July 2017. สืบค้นเมื่อ 7 October 2017. ↑ "268 767 habitants en 2014". ISEE. Archived from the original on 13 November 2014. สืบค้นเมื่อ 16 November 2014. ↑ "Norfolk Island". The World Factbook. CIA. Archived from the original on 3 July 2015. สืบค้นเมื่อ 22 July 2015. ↑ Australian Bureau of Statistics (27 June 2017). "Lord Howe Island (State Suburb)". 2016 Census QuickStats. สืบค้นเมื่อ 7 July 2017. หน้านี้แก้ไขล่าสุดเมื่อวันที่ 20 ธันวาคม 2560 เวลา 23:10 น.